The green mac and cheese story is in fact a perfect illustration of Cheng’s food philosophy of fortifying what you eat with as much nutrients as possible. She started Kye’s (named after her son), a restaurant specializing in super foods, as a way to feed her son who has multiple-food allergies. Not long ago, Cheng herself discovered she developed a severe reaction to dairy. She also had the intense desire to fight the Goliath fast food industry options found on so many street corners (especially in greater L.A.). She simply didn’t want to raise her child in a world where a healthful lifestyle had to be compromised when eating out. Kye’s is located on tony Montana Avenue, one of L.A.’s well-kept secret streets for boutiques and food — also best known for Sang Yoon’s original Father’s Office. Montana has recently been booming with restaurants like Ox & Son’s, R+D Kitchen, and the new Italian hot spot Forma. Cheng has no restaurant experience, and Kye’s is her first foray into this competitive world. However, she does have degrees in molecular biology, spiritual psychology, as well as traditional Chinese medicine. The last discipline, in particular, is what really serves her well at Kye’s. Cheng’s formula for grab and go items known as Kyeritos include super food ingredients such as American ginseng, goji berries, licorice root, longan, and jujube. In fact, you’ll find these powerful components in Kye’s Tonification Herbal Water. The restaurant’s shakes are made with Chinese yam, which can treat ailments from diarrhea to diabetes. Make no mistake, however, Kye’s food is surprisingly delicious. It wasn’t the mouthful of Chinese apothecary flavors I was anticipating. 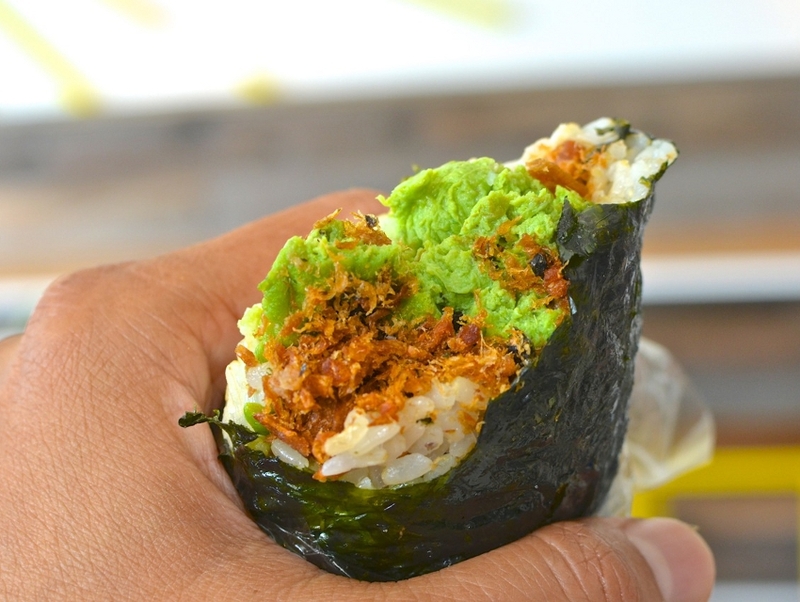 Case in point: The Nori Burger is wrapped in a sheet of dried seaweed like a big sushi burrito, but once you bite into it, unmistakable burger essences are experienced. 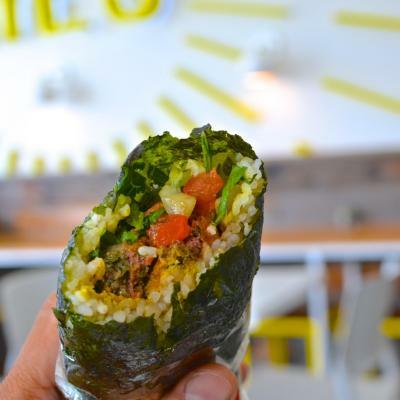 The grass fed beef is mixed with chard (a clear throwback to Kye’s green mac and cheese recipe); Nutritional yeast and brown rice are also found within the wrap. Mustard, lettuce, tomato, onion, pickles, and, of course, ketchup round out the standard burger ingredients. However, it’s the Asian-influenced Kyeritos that actually showcase the exotic stuff. 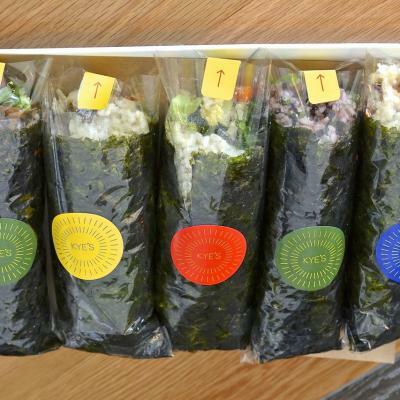 The 5 Spice Peanut Kyerito is dotted with goji berries, but the main ingredient of 5 spice stewed peanuts lend this wraps dominant flavor. Arguably an acquired taste, I can attest the bright, sweet, anisey profile combined with soft peanuts is distinctly Chinese and popular as a snack or side dish, but in this wrap, it becomes the main event. One of my favorite Kyeritos, oddly named Avo N Fuzz, includes green eggs (spinach mixed into egg), avocado, soy or salmon fuzz. The “fuzz” is really a popular Chinese and Taiwanese dried and fried meat called rousong. It’s light and fuzzy resembling bits of wool. I’ve never seen this stuff outside very specific Chinese restaurants or grocers. 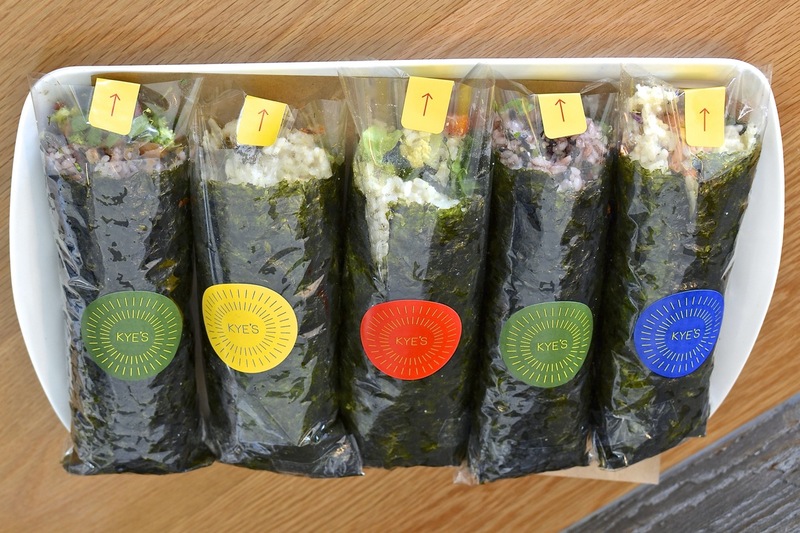 Kye’s offers a soy or salmon version for their healthful wraps. 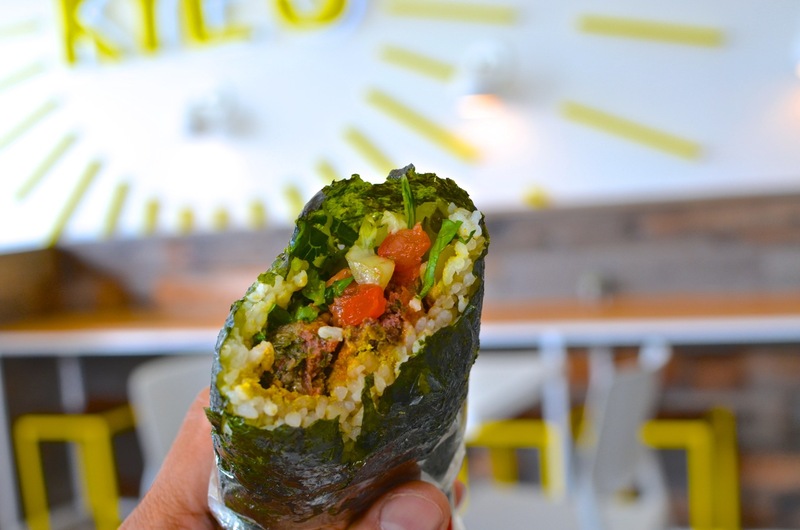 After geeking out on these special ingredients, I was thrilled to learn that coming soon would be other Asian-inspired Kyeritos including Bulgogi, the popular Korean BBQ beef — toss in kimchi, Asian pear, and gochujang, and you’ll practically speak Korean after a bite. A Chasu Pork Kyerito is also in the works. Next articleLook at How 9 Apartment Buildings Have Changed L.A.